Unfortunately this little american style deli is out of business. In 1995 when I came to Lyon for the first time, the sandwich world was completely different. Most of them were one ingredient sandwiches: ham on buttered bread, brie, salami on buttered bread, period. Then there was a fancy sandwich, ham and cheese, and that was called a "Mixed" sandwich. Eventually we started to see a leaf of lettuce, a tomatoe slice, or a pickle here and there. The only bread for them was baguette, which cut the roof of my mouth until I learned to eat it. There was no panini, no bagels, no wraps, no curry sauce, no mayo, no chicken or pork roast. A lot has changed, but a few things are still the same. For one, a meat sandwich only has a slice or two of meat, and that's it. You're lucky if you can taste it. My french husband drives me nuts when we make sandwiches because he eats all the bread. I'll get out the ham and cheese, and he starts out by cutting a few slices of cheese and putting it between two slices of bread. He'll eat that, then he'll get out two more slices of bread, put a slice of ham between them, eat it, and so on and so on. By the time he's full, my loaf of bread it just about gone! We've been together three years, and he still makes his sandwiches that way. It's not far from Place Terreaux. It's open tues and weds 11:30am-6pm, thurs and fri from 11:30am-9:30 pm, and sat from 11:30-8pm. I'm going to have to take my husband there on a regular basis for good sandwich indoctrination. Just check out this pastrami sandwich! If your looking for a place with great sandwiches, you should try Les facéties de Baltazar in Gerland (apparently they also have one in the city centre but I've never tried it). I like Sandwich very much. Thank you so much for this blog! 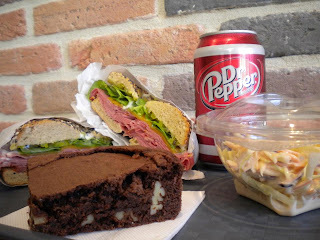 I was beginning to get a little desperate as to where I could find more "American" food in Lyon! Thanks for all the tips! My French husband reminds me that noodles are best with onions, chives the better with fresh skin dumplings, and eating Sandwiches in lingerie attracts beasts and birds of all fowle weayther.